Sea Breeze - Ponta Do Ouro Accommodation. 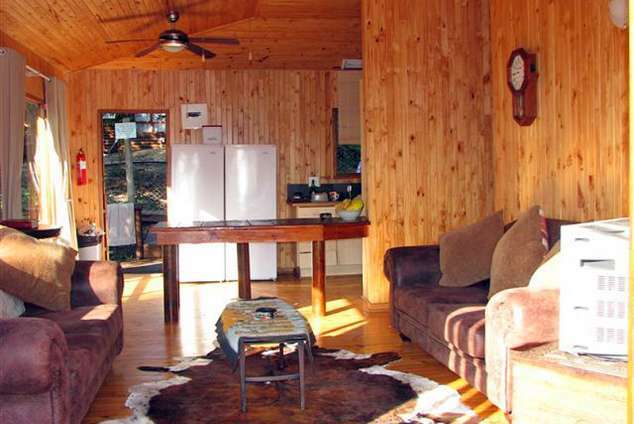 Situated in Ponta Do Oura this log cabin offers a large sunny deck for entertainment and relaxation. Set in a secure complex (with a communal swimming pool) the unit is within walking distance to the beach which offers rock pools, safe swimming and snorkeling. The beach is ideal for scuba diving, fishing, surfing, kite surfing and jet skiing. There are also restaurants, local curios shops and a local food market in the area. Sea Breeze has three bedrooms: one bedroom contains two single beds and the other two bedrooms have a double bed in each room, the main bedroom is en-suite. There are air-conditioners in each bedroom and there are also ceiling fans in the lounge area. All linen, including towels are provided (excluding beach towels). This unit sleeps a maximum of 6 people. The kitchen is fitted with the necessary cutlery and crockery as well as an undercover oven, HOB and fridge/freezer. A TV and DSTV (B&B Bouquet) are supplied for your enjoyment. 67148 page views since 11 May, 2007. Last updated on 17 Oct, 2018.